In the heart of a decrepit neighborhood in Detroit, Tyree Guyton started what is now know as the Heidelberg Project out of frustration for the riff raff that had moved into his neighborhood. Painting a crack house with bright-colored polka dots kept the criminals at bay and started an art movement that would divide residents of the city and of Heidelberg Street. Some people saw it as trash, others art. Twenty-five years later, the Heidelberg Project is still going strong, and is its own visitor's destination in a city that rarely gets visitors. Using collage art and rhythmical prose, J.H. 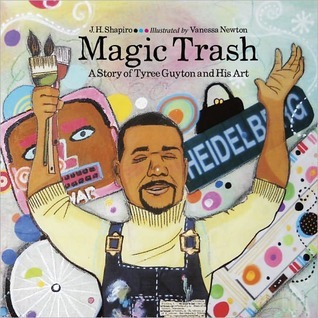 Shapiro and Vanessa Newton have captured the spirit and the soul of the Heidelberg Project in this book's scant pages.